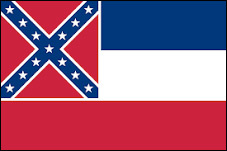 Feb. 7, 2019 — The open Mississippi governor’s race will be decided later this year, and a new Mason-Dixon Polling & Strategy survey (Jan. 30-Feb. 1; 625 registered Mississippi voters) finds Attorney General Jim Hood (D) and Lt. Gov. Tate Reeves (R) locked in a virtual tie. The Republican incumbent, Gov. 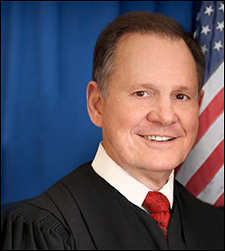 Phil Bryant, is ineligible to seek a third term. While Hood, a four-term AG, holds a slight 44-42 percent edge, Reeves has closed the original six-point spread that Mason-Dixon first found in their December 2017 poll (Hood 43 percent; Reeves 37 percent). In April of last year, M-D projected Hood’s advantage to be 44-39 percent. But, winning the popular vote is not all that’s required to win a Mississippi statewide race. In similar fashion to a presidential candidate needing to score a victory in the Electoral College, a Mississippi gubernatorial candidate must not only record the most votes in the statewide aggregate count, he or she must also win a majority of the 122 state House districts. Currently, Republicans hold a 72-46 split in the state House with four vacancies. Thus, it would appear Reeves would have a strong opportunity to capture at least a bare majority 63 House districts, assuming the statewide count is close. If no candidate carries a majority of state House districts, the state House members would then vote to decide the election between the top two finishers. Aug. 1, 2018 — Another new poll was released yesterday on the Florida Senate race, and the data provides us an in-depth look at where each candidate is strong. 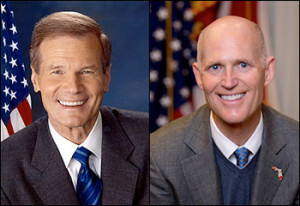 For more than a year, three-term Sen. Bill Nelson (D) and two-term Gov. Rick Scott (R) have traded the polling lead — from the time it became evident that the latter man, ineligible to seek re-election to his own statewide office, would initiate a challenge for the federal position. Mason-Dixon Polling & Strategy pre-released their new Senate survey results (July 24-25; 625 likely Florida voters) after publicizing their gubernatorial primary data last week. According to their conclusions, Gov. Scott has a 47-44 percent lead over Sen. Nelson. While the two candidates have repeatedly superseded each other in various public surveys, the two have almost always been separated within the polling margin of error. This is the fourth time since February of 2017 that Mason-Dixon has conducted a Florida Senate poll. But, this is the first where Gov. Scott has led. In their other surveys (Feb 2017, October 2017, February 2018, and the current July 2018), Sen. Nelson held an edge of five points (46-41 percent; Feb 2017) and a margin of one (45-44 percent; February 2018), or the two were tied (44-44 percent; October 2017). As you can see, in all four polls the two men are both in the 40s, with none ever commanding majority support. The current poll is no exception. Feb. 9, 2018 — The 2018 Florida Senate race is on the cusp of becoming one of the top political campaigns in the country, but polling has been scarce … until yesterday. Three different pollsters released data from their recent Florida electorate surveys, each testing the impending contest between Sen. Bill Nelson (D) and Gov. Rick Scott (R). Though the governor has not announced his candidacy, a loosely affiliated Super PAC has been spending heavily touting his accomplishments through various substantial statewide media buys. Since no other Republican candidate is even contemplating running, few doubt that the governor will make the race. That being said, Florida Atlantic University, the University of North Florida, and Mason-Dixon Polling & Strategy all released surveys this week. Though each arrived at different ballot test results, and all three have some methodological flaws, it is clear that the overall conclusion tells us that the Florida campaign is already in the toss-up realm. The FAU poll (Feb. 1-4; 750 registered Florida voters; 375 on-line, 375 via automated telephone system) returns the most surprising result. According to their sampling universe, Gov. Scott has a 10-point, 44-34 percent lead over Sen. Nelson. This seems far-fetched, especially in comparison with the two succeeding polls taken during the same time frame. Additionally, the polling sample contains too many Independents, and is a bit low for both Democrats and Republicans. This makes the ballot test response even more curious and suspect. Dec. 22, 2017 — If the Democrats are going to make a concerted run at the Senate majority, they must protect all 10, and possibly 11, of their vulnerable states, and then convert both the Arizona and Nevada Republican seats. Or, they must score at least one major upset in what should be a safe Republican domain if they don’t succeed in achieving all of the aforementioned. Alabama Senator-Elect Doug Jones’ (D) victory earlier this month makes attaining a Democratic majority mathematically possible even though the party must now defend 26 of 34 in-cycle seats next year when adding the new Minnesota special election to the calendar. Wednesday, two polls were reported in 2018 southern Republican states: Tennessee and Mississippi. The Democrats’ chances in the Volunteer State, though still in the long-shot sphere, have improved since former Gov. Phil Bredesen agreed to run for the Senate. WPA Intelligence, polling for the Super PAC, Defend the President, a group supporting Rep. Marsha Blackburn (R-Brentwood) in her battle for the open Senate seat (Dec. 13,14,17; 500 likely Tennessee general election voters) found the congresswoman leading former Gov. Bredesen by a healthy 43-34 percent margin. If ex-Rep. Stephen Fincher (R-Crockett County) were the Republican nominee, however, the race flips. Here, Bredesen would hold a 42-30 percent advantage.